This groundbreaking #1 international bestseller is sure to put an end to nightly bedtime battles. Children and parents everywhere can’t stop raving about this book! When Roger can’t fall asleep, Mommy Rabbit takes him to see Uncle Yawn, who knows just what to do. Children will join Roger on his journey and be lulled to sleep alongside their new friend. Carl-Johan Forssén Ehrlin’s simple story uses a unique and distinct language pattern that will help your child relax and fall asleep—at bedtime or naptime. I just heard about the book and ordered the hardcopy. A short while later I was informed by my spouse that my two little ones were still up and amped for their first day of school (tomorrow), so I added the Kindle version and downloaded it for immediate help. Note: Reading on an iPad in a dark room created its own distraction. Not recommended. I’ll use this version when we travel and use the hardcopy at home. The book has you insert your child’s name in, so I used the more active and harder-to-sleep one’s name. The forward suggests that it might take a few reads to get the pattern down and warns of unusual phrasings in the book which is certainly true. The book is a lot longer than I thought it would be and the way the iPad breaks it up I kept thinking the book was over, when a new section would start. This should allow easy stopping points on later to check on the kiddos and end the book if they are out. It took almost the whole book, but mine were out – and the one that never falls asleep first (whose name I was using throughout) was sleeping first. I downloaded the book while they were running up and down the hallway, 20min later I typed this review. This book was amazing. Granted, I have only used it once so far, but it was even worth the price for one blissful bedtime routine. My kids have NEVER fallen asleep while we read to them, not a ONE. They usually fall asleep after a couple stories, another trip to the bathroom, a sip of water, etc etc etc. It can take a while! 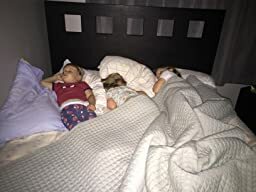 Last night all THREE kids fell asleep before I had finished half of the book. Amazing!